Last summer I received an invitation to spend a weekend as house guest of Bruno Paillard, at his Provence estate of Château des Sarrins. Come down and see what we are doing” he said, “you can taste the Sarrins wines, and my Champagnes”. A very tempting offer as Champagne Paillard was already one of my favourite houses, but visitors who are prone to fits of jealous rage may choose to stop reading now: “my friend Joël will be there too, and will cook dinner for us”. Who is Joël? None other than Joël Robuchon, one of the world’s greatest chefs. With his three Michelin starred Paris restaurant, hugely influential cook books and place of honour in the firmament of French culinary greats, there was not a moment’s hesitation: “I’ll be there” I replied. I flew into Nice on a balmy evening. Soon, I was speeding along the Mediterranean coast past the twinkling lights of Cannes and St Tropez on the Côte d’Azure, before heading 50 kilometres north through the wonderful scrubland of olive groves and vineyards. 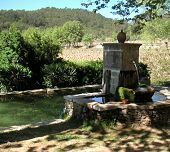 Sarrins sits southwest of the town of Draguignan, where I was greeted warmly by Bruno, his wife and Monsieur Robuchon. We settled down to a simple supper of quiche and salads, with a few glasses of Champagne. Château des Sarrins is located in the departement of Var, between the cities of Marseilles to the west, and Nice to the east. 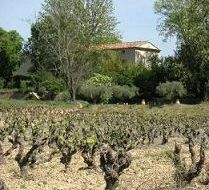 This region is the cradle of French winemaking, with vineyards planted by the Phoenicians around 600 BC. Bruno Paillard bought Sarrins in 1995, having already made his fortune with his eponymous Champagne house. 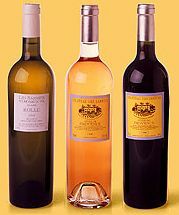 Sarrins wine is AOC Côtes de Provence, producing red, white and, of course, rosé which accounts for more than half of all wine from the appellation. His white wine is a single-varietal 100% Rolle, and as such is inelligable for AOC Côtes de Provence, so is designated Vin de Pays du Var. Clearly the Paillards see Sarrins as a home as much as a business; it is their retreat from a high-pressure business life in Reims and Paris. 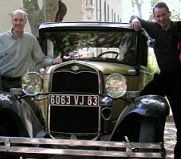 Bruno keeps a small collection of vintage cars there, and likes nothing more than carting guests at breakneck speeds around the country lanes surrounding the property (Myself and Bruno, left). But Bruno takes his winemaking seriously and has invested much personal time and effort into renovating and improving his little estate. Champagne Bruno Paillard is an independent, family-owned house, though as well as the 600,000 bottles produced annually, Bruno is also a leading broker in Champagne. The latter is the business in which he started, several years before creating Champagne Paillard in 1981. I imagine for Bruno, day to day business is as a Captain of Industry, and is far removed from the artisan wine-grower. As a man who’s great passion for wine and belief in the importance of terroir became evident over the few days of my visit, I can fully understand his obvious love for this little estate. All grapes are hand-picked, with each variety judged to be at its optimum. The decision is not always purely based on alcohol levels; the rosé, for example, is picked based on acidity, not potential alcohol, to produce a crisp, fruity style with no residual sugar. There is no filtration, and all aspects of the operation are painstakingly detailed. The vineyards surround the Château. Where Bruno hasn’t re-planted, these are mostly very old vines: Grenache, Mourvèdre, Cinsault and Syrah, with Rolle for the white. (The Château viewed from the old Carignan vineyard, right). Bruno has been altering the balance of these plantings, and has also planted Cabernet Sauvignon, Merlot and Ugni Blanc to make Vin de Pays wines. In 1996 Bruno built a brand new cellar, gravity-fed, with stainless-steel tanks and a barrel-room for ageing and fermentation of his whites. After a good night’s sleep I came down for breakfast next morning, joining the Paillard’s. Joël was nowhere to be seen, and I wondered just how much Champagne had been supped the previous evening after I had retired! However a few minutes later Joël emerged from the kitchen in full chef’s whites, and behind him I was astonished to see two other chefs from his brigade already hard at work. Apparently these two had arrived from Paris first thing, bringing with them large ice-boxes full of the ingredients for today’s lunch. I began to sense this would be something rather special. After breakfast we set off for a tour of the vineyards and facilities, then to the tasting room for a first chance to taste the wines. Let me say straight away that this is probably the setting Provence rosé wines was made for, with the sun streaming through open French windows, the chatter of larks high in sky, and views over a sun-dappled vineyard landscape. How producers of rosé must pray for a British summer that defies the norm when trying to sell us their wines. Cinsault, Syrah and Mourvèdre grapes (55%, 30% and 15%) are tipped straight into the press, where they undergo a very gentle, 10-hour pressing, by which time the most delicate salmon-pink colour and subtle flavours have leached from the skins. The juice is run off to ferment and settle. The nose is lightly herbal, with soft strawberry fruit and pepper scents. It has lovely finesse on the palate, and is a genuinely gorgeous rosé: a real wine with copious fruit and only a modest 12% alcohol. Excellent. The dream-like surroundings did not totally influence my opinions on this: I tried another bottle on return to Scotland and liked it enough to award it “wine of the month”. 100% Rolle, this wine is fermented and aged in new Alliers oak, for a fermentation which last 15 to 20 days. It rests on its lees for a further nine months with battonage (stirring) to help it gain texture and richness. Nicely honeyed nuances to this, over gently toasty aromas with pure, clean pear and peach and a definite nuttiness. The palate is dominated by sweet, ripe pear fruit given complexity though herbal notes and then plenty of toasty, powerful oak. I felt this wine was slightly overpowered by the wood, with just not enough weight to the fruit, but it has good acidity and length and shows real potential. Very good/very good indeed. Better integration of fruit and oak is immediately obvious here, with a nose suffused with pear. On the palate it is full and rich, with plenty of fruit sweetness and a gentle herbal quality that adds complexity. Vanilla notes fill out the finish, but there is good balance. Very good indeed. Half of this wine is Grenache, the balance made up of Syrah, Mourvèdre, Cabernet Sauvignon and Carignan. Maturation is on 1, 2 and 3-year-old Alliers oak barrels for one year. There is plenty of cedarwood and sous-bois on the nose, with truffle, pepper and ripe, autumnal berry fruit. The palate is full and dense, with plenty of wild strawberry fruit, hints of rose-hip and generous tannins. There is gentle but persistent acidity and a nice bright red-fruited character. Very good indeed. This has developed a lovely gamy quality on the nose with a meaty, slightly bloody edge to forest berry fruits. There’s a seam of focused blackcurrant and plenty of spice. On the palate it is concentrated and structured, with more blackcurrant and a plummy depth of fruit. Dense and yet fine on the plate, this is wrapped in cedary oak with a bold, sinewy structure adding some muscle. Ripe tannins and good acidity complete a very impressive picture. Very good indeed in a meatier style than the 2000. In part II you can read about the extraordinary banquet prepared by Joël Robuchon and accompanied by Bruno Paillard Champagnes. I have extremely happy memories of a few days spent in this idyllic and unspoilt corner of rural France, and of a really fine range of wines made from typical local grapes.